Ditch the cables and record professional-quality sound with Spire. It’s the world’s first truly wireless recording solution that will have you recording in seconds. Edit, mix, and share your recorded songs instantly via a built-in Wi-Fi connection between Spire Studio and the free, Spire app for iOS. Whether capturing a moment of inspiration or collaborating with bandmates, Spire delivers a new kind of recording experience. 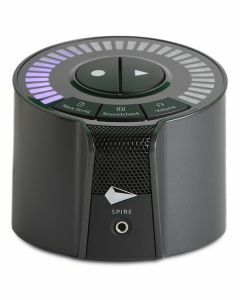 iZotope's award-winning sound processing technology gives you studio-quality recordings that other portable devices don’t offer – a built-in professional microphone, two inputs with Grace Design preamps, plus studio-grade effects like reverbs and delays make Spire Studio a small package that delivers big when it comes to your music. No tech barriers to overcome. No momentum killing setup. Just your sound recorded quickly, easily and with pristine clarity. Whether you’re capturing inspiration, collaborating with bandmates, or sharing tracks with fans, your Spire Studio is ready. Anytime, anyplace. Everything you need from a professional recording studio is right here. Multi-track eight parts in your song. Inputs for the whole band, plus the ability to elegantly edit, mix and share your tracks with the free Spire app for iPhone and iPad. Portable recording with no compromise in quality – that’s Spire Studio. Built in Wi-Fi so you can ditch the cables with wireless connection to your phone. Fully equipped with a 4-hour rechargeable battery means you now have a full studio that fits in a guitar case or small bag . Enjoy the creative freedom that comes from not being locked in a basement studio. Easily export your music to a computer or favorite audio editing software like Pro Tools, iMovie, and Logic, or upload to storage platforms like iCloud, Dropbox, and Google Drive. The Spire app requires iPad, iPhone 6 or higher, and iOS 10 or higher. Download the app for free on at spire.live/download.